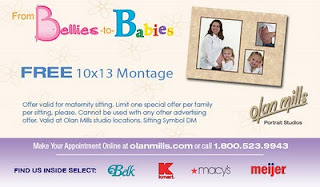 Olan Mills has this awesome coupon out for a FREE 10 X 13 Maternity Photo Montage! I love it, and I am going to talk my daughter into using it..... just a little over 6 weeks until my Li'l Priss arrives! So click this link to print out your coupon, and either go online to olanmills.com or call 1-800-523-9943 to set an appointment.